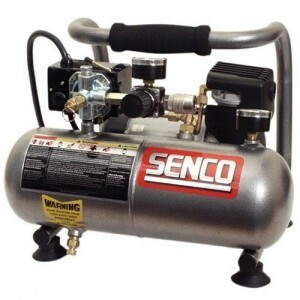 When you are looking for a nice little air compressor for small jobs at home, the Senco PC1010 is one to consider. 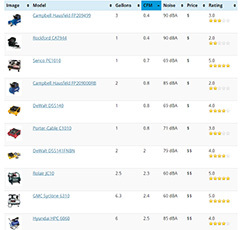 It is small, lightweight, quick, and consistently listed on various top 10 lists. You can get in between 20 to 44 nails per minute with this little one horsepower model. The tank is one gallon so while the PC1010 is not meant for jobs requiring long stretches of high airflow, it’s perfect for most smaller tasks. It is easily portable because of the cushioned handle bar on the top. It only weighs about 20 pounds, so it’s easy for almost anyone to carry around from room to room. The hot dog shaped tank is made of aluminum which is both light and ergonomic. Because of its small size, the Senco PC1010 has only 1 horsepower at peak performance. During normal use, it runs at about half of a horsepower. It takes about 2 minutes to get fully powered and then requires around 30 seconds for recovery. Because of the low power and small tank size, you would not want to use this on jobs which requires constant air flow. You do get up to 125 PSI, with an SCFM of 0.7 at 90 PSI. The pump is easy to maintain because it does not require any oil. It is an oil-less pump made of cast iron and has a direct drive induction motor. This setup is common with good quality small air compressors. At about 69 decibels, this compressor is extremely quiet, too. People are shocked at how quiet it is, especially that it is so small. Usually, when you give up on power and features, a typical compressor is quite loud. You can easily use this for crafts, hobbies, and small finishing projects because it is so quiet. This Senco model is definitely not for heavy duty contractors or those requiring large projects to be done quickly. It’s perfect for hobbyists, crafters, and home owners who want the convenience of a light weight compressor rather than one with a lot of power. 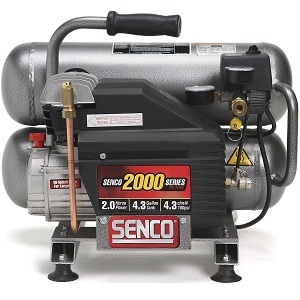 While most users will be men, the Senco PC1010 is one of the best air compressors for women due to its small size, low noise, and ease of use. If you're in need of a more powerful compressor that's almost as light as the Senco, take a look at the Bostitch CAP1512-OF. One of the best features of this compressor is the small size. It’s easy to carry around the house for small repair jobs. I would recommend the Senco PC1010 for novices and those who would normally not consider themselves handymen (or handywomen). The fact that the compressor is maintenance-free makes it great for those that want to simply use a compressor and not have to service or fix it. My teenage daughter recently used it as she is getting into air brush work so although it may seem strange, she will probably be getting a Senco PC1010 air compressor box under the Christmas tree this year.